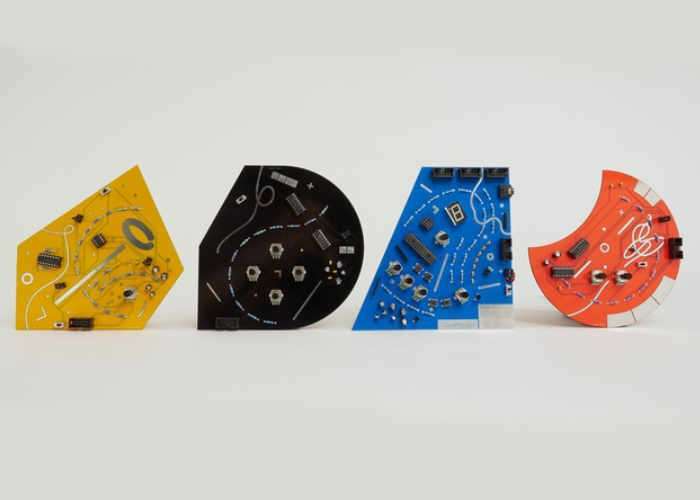 Design company Artists & Engineers based in London have created a new range of handheld modular synthesisers, which have been created to “explore the border between play and sound” say the development team. Watch the video below to learn more about the POLYTIK modular synths which are available from £120 with shipping expected to take place during May 2017. Born out of a DIY ethos and the maker community, Polytik has been crafted into something very different – a series of beautifully designed objects in their own right. Polytik is open-source hardware and encourages users to make new modules and hacks. Polytik comprises four separate, colour-coded, battery powered modules. Every Polytik system needs a Core module and at least one sound module. The sound modules connect to the core with ribbon cables, these carry audio and control data to connect the system together giving you a single audio output for all modules. You can have up to three sound modules connected at one time. The Starter Pack comprises a Core module and a Combi module, which we think is a really good way to start using Polytik. For more information on the new POLYTIK modular synths jump over to the Kickstarter website for details by following the link below.